Before going into all the positive events of this past year we remember three good neighbors who are no longer with us – Muriel MacKay Ross and SECA members Signe Gauer and David Livingston. These active, principled people will be sorely missed. I would also like to acknowledge Joan Carruthers for all her work with the Boat Basin struggle. A fine example too, of mobilizing the public over an issue. The infamous White House is now reborn as the Rowe House. SECA interacted with Youth Services and Sydney was instrumental in liaising with them. There was the highly successful Kismet Coffee House in April of which we can thank Chris and Micheal. Cathy and Charles were made Patrons of the City of Nanaimo for all their years of contribution to the community. With the Waterfront Planning Committee, SECA’s invitation to join shows our credibility as an organization. Our Neighborhood Plan became a guiding mechanism for the process. I would also like to point out the huge potential for the waterfront in Nanaimo. We have given a number of letters of support to various groups, Centre Stage being one example. There has been a series of articles about the neighborhood in the Nanaimo Daily News by Douglas and Paula. These help change people’s sometimes negative opinion of the South End. The Sensory Garden Project is underway and will be placed somewhere in Deverell Park this coming year. An anthropologist looking back at this time period might be forgiven for mistaking malls as a community’s Christmas seasonal gathering place. The shopping throngs may be contributing to the economy but the pressure to demonstrate love via mass purchasing also contributes to this being one of the most stressful times of the year for many people. It is also a time when many people feel an increased sense of marginalization, isolation and separation from family and community. Recognizing the stresses and isolation experienced by many people at this time, the Nanaimo Women’s Centre approached several local agencies with the idea of collaborating on an event to bring people together in a way that fostered community, well-being and a sense of connection. The plan was to offer a space to visit and a of variety fun activities, including making homemade gifts and decorations. The initiative was strongly embraced and inspired the first ever “Winter Community Celebration” being held on December 1st at a space provided by John Barsby School. With the support of over twenty volunteers, seven agencies and sponsorship from the Altrusa Club, Tim Hortons and Telus, the event was a wonderful success. Barsby’s Multi-Purpose room was set up with activity stations and volunteers helping people with all kinds of projects, such as making cards, crafting beautiful cedar roses and decorating cookies. There was a holiday photo station offered by Shayd Johnson and a community post office where postage was provided so greetings could be mailed to friends or family. A warming chili luncheon was served and there was no shortage of cupcakes for desert. The atmosphere was relaxed, fun and welcoming. In addition to the Women’s Centre, the event was hosted by Tillicum Lelum, Inter Tribal Health, Mid Island Métis Association, Nanaimo Family Life Association, VIHA’s Discovery Youth and Family Substance Use Services and MCFD Aboriginal Child and Youth Mental Health. Based on the reception this year, organizers are encouraged to make this an annual event. I think the South End Community Association will be very pleased to support this celebration next year. Huge kudos and thanks to all of those involved! The Annual General Meeting for SECA will be held on Wednesday, December 4, 2013 at Princess Royal School. This get together will start one hour earlier than our usual meetings because you are invited to take part in a potluck which will start at 6:00— prior to the meeting. 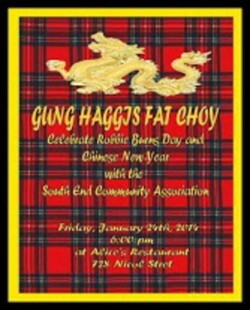 You are invited to a celebration of Gung Haggis Fat Choy at Alice’s Restaurant on January 24th hosted by the South End Community Association. Tickets ate $12 for adults ,$6 for children, and $30 for families.